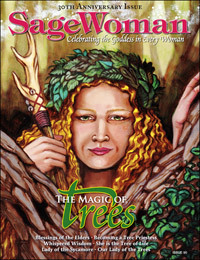 SageWoman #90 The Magic of Trees (paper) [sw090p] - $10.95 : BBI Media - Magazines that feed your soul. SageWoman #90 - The Magic of Trees. "The trees are our elder kin." In this special issue, our readers and writers share their stores of their many enchanted relationships with trees. We begin with “My Friend, Elin" Shannon Murray's examination of her unlikely friendship with a redwood tree in an urban park, and continue with Druid and author Danu Forest’s discussion of how forests and trees inform the legend and lore of Celtic lands in "Blessings of the Elder." A new immigrant from Sweden, Sophia Axelsson finds herself isolated in her Appalachian home until she discovers that “Trees are Our Friends," while Ginger Hollingsworth-Cox stumbles upon the magic of a very different type species in "Song of the Desert Tree." We witness the genesis of a true warrior and nature advocate in Kathryn Ravenwood’s essay, "Becoming a Tree Priestess," and listen as author Sandra Kynes describes her many encounters with Willows and Maples in "Whispered Wisdom." Lynn Roberts delves deeply into the many ways that trees purify, nurture, and revive us in “Lady of the Sycamore," while Jill Hammer explains the deep-rooted images of tree woven throughout Jewish (and pre-Jewish Canaanite) culture in "She is a Tree of Wisdom." Our columnists share their wisdom, too: Diana Paxson describes the deep roots of tree magic in many cultures in "Our Lady of the Trees," Susun Weed calls on the power of belief to heal in "Mind Medicine," Allison Leigh Lilly describes acorn magic in "Planting Pennies," Janet Callahan ponders a childhood rite of passage in "On Climbing Trees," and Donna Henes unveils the lore of Yggdrasil in "Mother of Trees." Crone Song columnist Lizann Bassham digs into the earthy magic of trees she has known and loved; dream expert Anne Hill ponders the lessons of a pivotal dream experience in "Sleeping Under the Trees," and Danielle Blackwood salutes the tree guardians of her new island home in "Wise Elders." Crystal Blanton shares how a visit to Muir Woods helped her overcome her fear of the outdoors and brought her closer to her mother in "For the Love of Redwoods" and outdoor educator Rebecca Bailey introduces us to a venerable Utah juniper in "Grandmother Tree." Finally, Leslie Linder delves into the lore and myth of horned animals in "The Antlers of Sovereignty" and scholar Nancy Vedder-Shults Ph.D. continues her examination of the Goddess roots of the mythology of Durga in her second installment of "Durga & Pre-History." The coda of this issue "At Home in the Trees" by Corrine McEachern offers a quiet tale of how a special grove of trees helped the author find her path again after a time of trials. Plus: our exclusive in-depth interview with herbalist Holly Bellebueno, the author of Women Healers of World: The Traditions, History & Geography of Herbal Medicine as well as The Authentic Herbal Healer, and The Essential Herbal for Natural Health; reviews, poetry, and our marvelous Reader’s Write section, "The Rattle." 88 pages, published at Autumn Equinox, 2016.